Written and directed by Nicole Zweiback, Bit of Sunshine is a one-woman play about youth at risk and eating disorders. Kira is a teenager whose parents died suddenly when she was only eight years old and the difficulty to cope with this loss is channelled immediately into bulimia. The play starts in darkness and when the lights go up Kira is there, staring at the audience. Then, for a moment, it’s dark again and next Kira is on a different spot. The idea is good and could suggest the ubiquity of the disease but the effect is spoiled by the use of neon tubes that don’t switch on and off fast enough. There is a stack of chairs in the corner and a window on the back wall, which will prove to have symbolic role within the play. 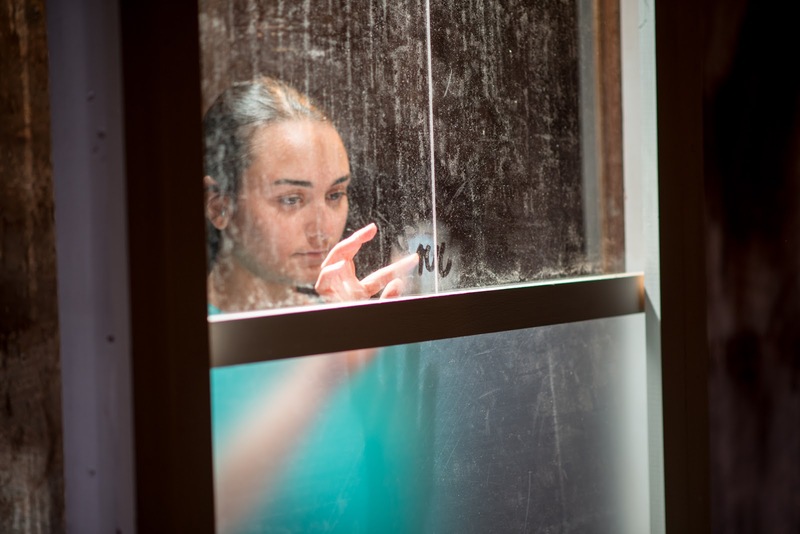 It nods to the ‘bit of sunshine’ Kira can get into her room at the clinic but also to the loss of her friend Polly. The topic is a sensitive one and some of the lines are quite poignant – like when the girl describes the aberrant pleasure of feeling empty, then full and then empty again. Nonetheless, the overall impression I get from Bit of Sunshine is an unsatisfying feeling of a déjà vu. The actress’ presence on scene, her fiddling with the chairs, going up and down, running back and forth, as well as her gratuitous swearing and her recurrent yelling, resemble more an acting workshop than an accomplished piece of theatre. The language is quite mundane and filled with phrasal clichés that would apply more appropriately to song writing than playwriting. It’s as if Zweiback had clear ideas in mind but failed to find her own voice to express them. My companion, in fact, observed rightfully that the shouting kept alive a play which, otherwise, risked to become boring. Despite the troubled matter, its development is quite straightforward and its conclusion unsurprisingly tragic. We witness false illusions, cheated hopes and death. We feel for the little girl who dreams to go to Oxford but is not strong enough to get over her mental illness once and for all. We relate to her unease and her strive for perfection. We sympathise with the weakness of her willpower. But nothing about this play is new – nor its subject, nor its design – and this seem to cause a lack of engagement on both sides of the stage. I’d like to think of Bit of Sunshine as a starting point, a work in progress that is now being tested with the public and takes this opportunity to flourish into an intense and moving monologue.